Boost the amplitude of low amplitude data relative to high amplitude data. 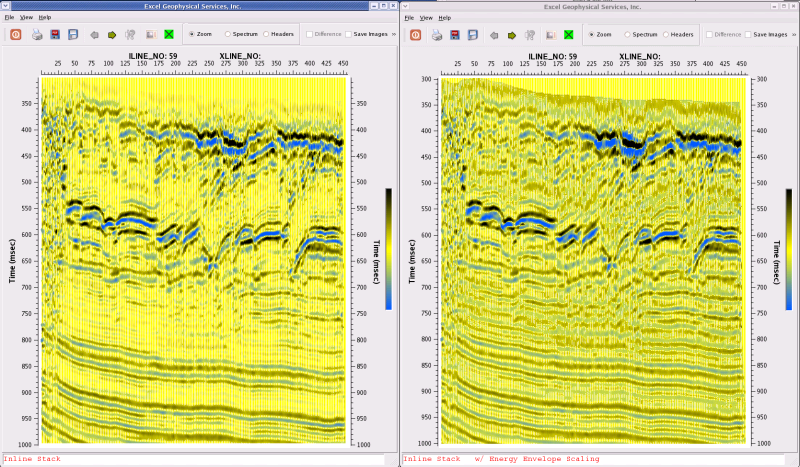 The tool computes a smoothed energy envelope of the dataset and then builds scallars that boosts the amplitudes in the low energy zones relative to the high energy zones. In some areas, strong seismic amplitude events will over-shadow the weaker amplitude events belowi it. Energy Envelope Scaling will boost the amplitude of the weaker events to alllow interpretation. a) Inline Stack, b: Inline Stack with Energy Envelope Scaling.